Sleeping Bones is the seventh book in the mystery series following lesbian detective Kate Delafield. Written by the classic lesbian author Katherine V. Forrest, this famous series has won a number of awards. This is the first book I've read in the series, and so I've missed out on some of the earlier history. However, it stood very well on its own. A warning - the first couple of pages are an excessively overwrought description of a tragic predatory encounter at a prehistoric tar pit. Luckily the rest of the book loses the purple prose and cringe inducing anthropomorphism in favour of fast moving, if slightly bewildering, crime solving. The plot starts out with a prosaic murder mystery - the father of a famous paleoanthropologist is found murdered at the Rancho La Brea Tar Pits in Los Angeles, (which are extremely famous and important, full of preserved animals dating back 40,000 years). The crime complicates, of course, and soon the CIA are involved, chasing after the 750,000 year old bones of the Peking Man, discovered in China and lost during WW2 when the American marines (including our murder victim) where captured by the Japanese. While the various mysteries are mostly solved, they aren't particularly resolved, which I found a bit frustrating. And the plot got slightly far fetched, as the author tried to justify bringing in the CIA to what was initially a fairly standard murder mystery. There's quite a bit of paleontology and paleoanthropology discussed - something I found fascinating, as I am fond of science and remember studying bits of it, but other people may find tedious. Most of the events, dates and discoveries mentioned actually took place, though to date the actual bones have not been found. As far as I can tell, all the main characters are entirely fictious. 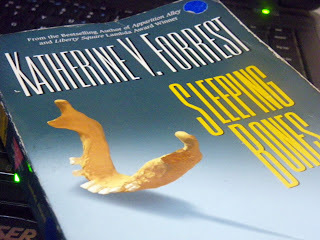 As Sleeping Bones is set in the nineties, some aspects are joltingly dated - a complete lack of digital cameras, for example. The murder victim, Kate and the CIA all have military history and the plot revolves around events dating back to Pearl Harbour and Hiroshima. The frequent references to, and solid grip of, events such as the Vietnam war and other military clashes of the USA also seem oddly previous. However, not being in the USA, I am rather vague as to how immediate these events would seem. However, it's not overly jingoist, and has a fairly impartial view of the motives of the various countries potentially involved. The dated aspects slide the book to the edge of 'mystery' and over the edge of 'historical', but not enough to firmly wedge it in the latter genre. Still, fans of reading about the distant past will enjoy both the dated technology and the paleoanthropologic references. Distant past being entirely relative, there. Kate is in the closet by default - she avoids bringing up her sexual preferences or her personal life, but she's starting to feel guilty about hiding her wife. Some of it is her personality; I get the impression that she wouldn't be that comfortable letting her personal life intrude onto her job, no matter what her personal life involved. Her partner is regularly in her thoughts, though and she's by no means a 'lesbian in name only'. It would have been nice to see more of Aimee - Kate's interactions with her were fairly perfunctory, but I got the impression that their relationship, their marriage, was very important to her. And much of Kate's past life - her family, friends, past career - was summarised, but only to set the stage for new events. While the context was appreciated, the personal was very much sacrificed for the professional. Which is actually a fairly good description of Kate. Oh, there were some personal subplots - a long lost brother, an attraction to one of her suspects, a little off the books policework - but they didn't recieve nearly as much depth or attention as the main plotline, the actual crime mystery. The only real dramatic intrusion to her working life, her despised Aunt Agnes, is resolved very easily. This is pretty typical of this type of career-driven character, and reminds me of the exception which proves the rule - Aud Torvingen, Nicola Griffith's ex-policewoman, floating around at odds and ends with lots of money and no job, whose mysteries are deeply entwined with her personal life. Her books are very good and highly recommended (there's an overview of the series here). However, it being an ongoing series, I'll extend the benefit of the doubt and assume that I've simply come in so late, I've missed lots of juicy character development. Kate herself was certainly a vivid and believable character, who carries much of the plot along by sheer will and powerfully embedded routine. So overall, a fun and acceptable mystery, slightly dated with a plot that gets a little out of control and an unsatisfying conclusion, but worth picking up. All the other books in the series also picked up awards in the Lesbian Mystery category (except for the first two books, which pre-date the Lambda Awards). Katherine V. Forrest was also the recipient of an Alice B Reader award in 2005.